Allegiant is a U.S.-based carrier operating on the low-cost airline model. That means every attempt is made to keep airfares as low as possible by requiring passengers to pay for many non-essential services that come standard with traditional airfares. Allegiant focuses on serving smaller airports, which it links to leisure destinations in warm climates. It is important to compare airfares at other airlines with the total cost of an Allegiant trip, not just the cost of the ticket. The Allegiant website is relatively hassle-free. The same cannot be said for terminal set-ups in the two airports we used. Allegiant does not host self-service check-in kiosks. When buying online, the only way to show up at the airport with printed boarding passes and an assigned seat is to pay a passenger fee prior to checkout. For another fee applied the round-trip, you can get "priority boarding," which means you'll be among the first to board and acquire overhead space without waiting in lines. On our flight, those who didn't pay were relegated to "Group Z," or the people who are last to board. To obtain these Group Z boarding passes, one waits in sometimes lengthy lines for a traditional airport check-in. If you elect this approach, be sure to arrive at the airport well in advance of your departure time. You may print your boarding pass at home or receive an electronic pass for your smartphone at no charge. Boarding passes printed at the airport cost $5. In-flight snacks are not provided with the fare but may be purchased from flight attendants. Baggage fees for Allegiant can be discounted if paid in advance online. But take note: these baggage fees are per flight segment. If you make a stop along the way, a new segment is created. There are separate and much higher charges if you reserve after making the reservation or at the airport the day of your trip. Note that the weight limit for bags is 40 lbs. We took a trip between Chattanooga, Tenn. and Orlando (Sanford) for $130 per person, round-trip. At the time, it was the lowest such fare we could find between the two markets. But remember that the Sanford airport is about 40 miles from MCO. Since affordable shuttle service is scarce in Orlando, it required a car rental. Not wanting to pay for seat reservations, we took our chances with the open seating. It was not a problem on our trip in either direction. Your experience could differ. Although neither Chattanooga nor Sanford were the most convenient airports, both facilities were pleasant and uncomplicated. Airports such as these present fewer gates and less confusion, yet offer all the services you'll need. The Allegiant fleet numbers over 80 aircraft and the line fly 300 routes that are spread across all regions of the U.S. The airline serves large airports such as Fort Lauderdale and Las Vegas but often goes into smaller airports in large metropolitan areas as well as small- and medium-sized airports. For example, the large Orlando market is served by Sanford International Airport, not Orlando International. This can create additional ground transportation costs that cut into the savings from low airfares. Allegiant hubs are in six airports, including Bellingham, Wash. (just across the U.S. border from Vancouver), Los Angeles, Las Vegas, Phoenix-Mesa, Myrtle Beach, S.C., and the Florida cities of Tampa-St. Petersburg, Fort Myers, Fort Lauderdale, and Orlando. You'll note that many cities in the Allegiant system are not connected by daily service. This could preclude people with tight, inflexible schedules from booking flights. 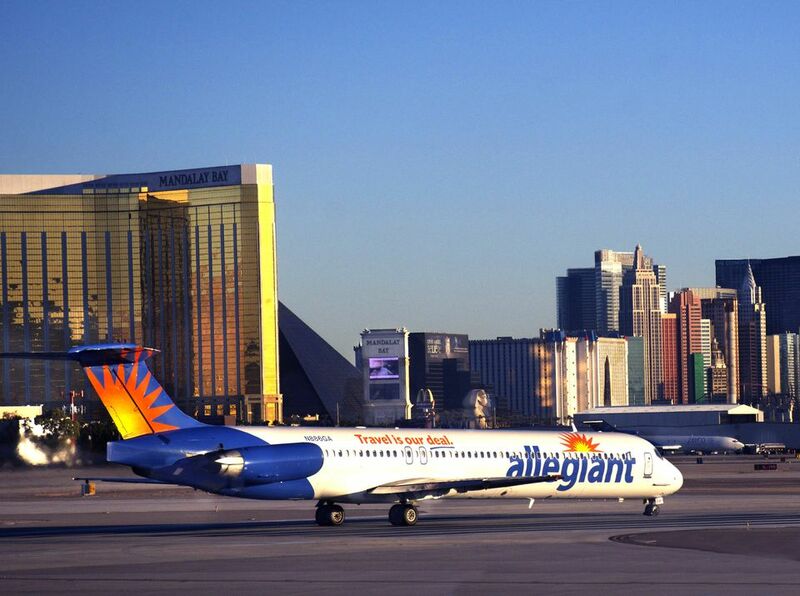 Allegiant provides service to smaller cities, connecting them to major cities at low prices. But you'll have to navigate through a series of airline offers for vacation packages, car rentals, and the aforementioned seat reservation fees. Airport check-in is slow and requires patience. The personnel we encountered were helpful and professional, but at times appeared overworked and overwhelmed. For travelers who are comfortable with the budget carrier model of a la carte pricing, Allegiant is an airline well worth shopping for budget airfares. Price the cost of your trip carefully.